If you plan a trip to Sturges you must stay for a few days as this is a wonderful park. Great Location, close to lots of interesting and fun attractions. Great Staff, friendly and accommodating staff. Great Entertainment, we really enjoyed the locals and guests entertaining in the evening. We will most definatly stay here again should we venture back this way. Wide open field with hookups. If campground had been full, it would have been crowded. Gravel roads and sites, but in good condition. Close to I-90. Wi-fi was just OK and no cable TV. Bathroom in the laundry room was OK. The individual ones in the lower campground were randy. In the upper campground, they were OK, but a long way from the sites in the lower campground. Thought that there was more to do in Sturgis. Seems like much of the town shuts down if there is not a motorcycle event going on. The drive thru Spearfish Canyon was very nice and Deadwood is a fun visit. Rush No More, Sturgis, SD - What a great place for quiet get-away. A short trip from route 90, yet close enough to see the sites. Mount Rushmore is about thirty miles away but a nice ride. Campground is very clean and well maintained. The facilities, while older and well used, were clean and functional. The staff was very friendly...even picked up / filed / delivered propane to our site. A great place to enjoy the Black Hills sites. We much enjoyed our stay the week-before-biker-week. 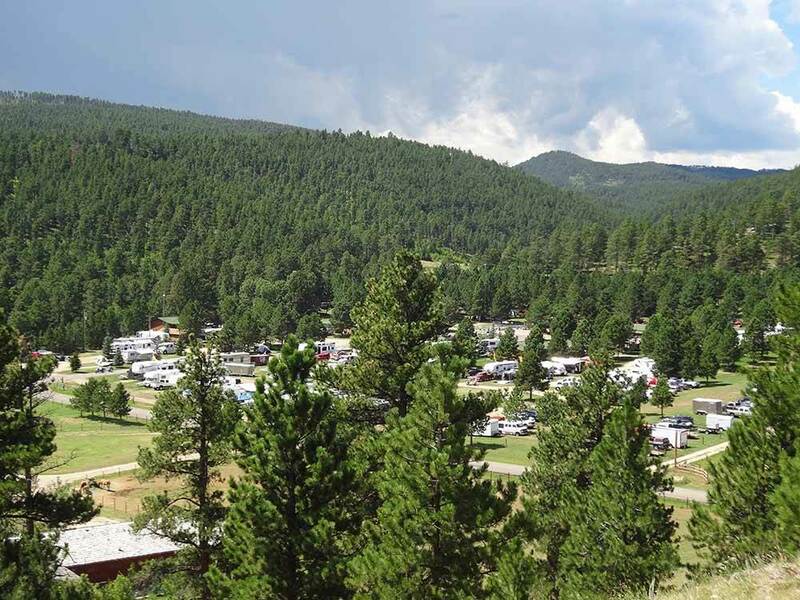 We found this campground to be in a central location to head out each day to the attractions in the area. While close to the highway, it was far enough off it to be quiet and secluded. The signage posted made it easy to find. While the set of unisex bathrooms were smelly at times, the ladies and men's bathrooms near the cabins were always clean. The staff members were extremely helpful and even lent us an electric grill for out stay. The onsite bar and game room area was inviting and relaxing. Full hookups were convenient, clean, and easy to use. Not a lot of shade and trees, but the video and pictures on the website are accurate. We would recommend this campground and would stay again next year. What you should know about this campground: 1.When registering we were told the Good Sam rate was higher than the campground rate - and shown a chart to demonstrate the point! 2. Although they have limited wifi - they do NOT have Internet. The CG Internet provider stopped providing the service. 3. AT&T provides NO cell service within the CG. You are OK with Verizon. 4. Both(meaning only 2) unisex bathrooms were clean. On the positive: the campground has a nice Black Hills setting and is quietly off of the Interstate. The employees were friendly. I recognize that ratings are subjective, but I think Good Sam did a deservice to the campgrounds that have financially invested in their infrastructre to obtain their ratings and were overly generous with the ratings for this campground.